A woman’s hair is often referred to as her crowning glory. If this is true then Hannah had a beautiful crown. She has always seen herself as a sort of princess and had us all convinced that she was, in fact, royalty. As such, her long silky chestnut brown locks were enviable and a fitting finish to her sweet personality and beautiful face. 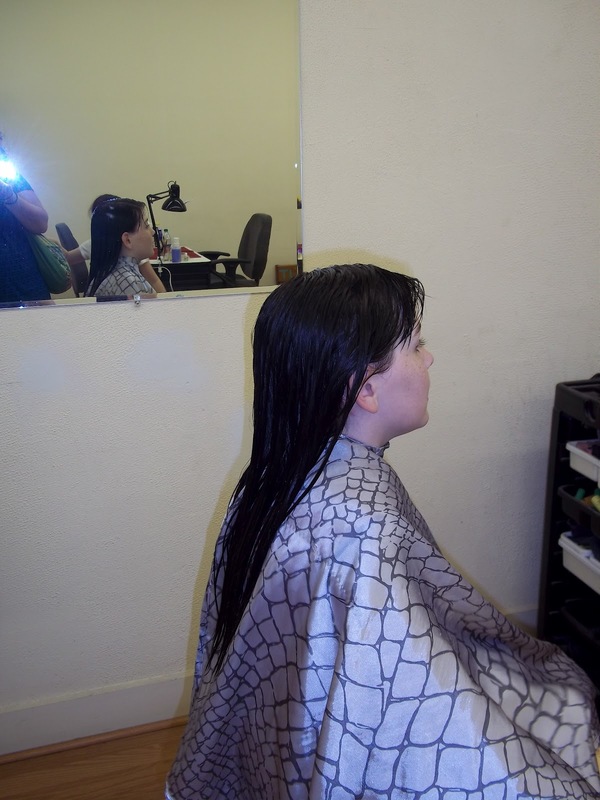 While Hannah is not overly vain or consumed with her looks, (unlike a certain 7 year old that I know…Gianna) I was a little bit surprised when she asked to have her hair cut. I was unsure if she would really like her hair if it was short. She has always had long hair and it was just so darn pretty. But she insisted that she would love it. It was summer and her hair was so hot. It would be so easy to do if it was shorter. It would be better for swimming. She went on and on and I was giving it some consideration. But then she said something that swayed me completely. She looked at me and said, “Mom, I want to donate my hair. I want to give it to a little girl that doesn’t have any hair.” My voice caught in my throat as I tried to answer her. As the mother of a survivor of childhood leukemia, I spent alot of time with little bald beauties. While Dj was not bothered by his Michael Jordan bald-do, I saw many little ones at the oncologists that struggled with the loss of their hair. The fact that my little Hannah came to me and offered up her own beautiful hair to make a wig for a sick child, made this Mommy very proud. 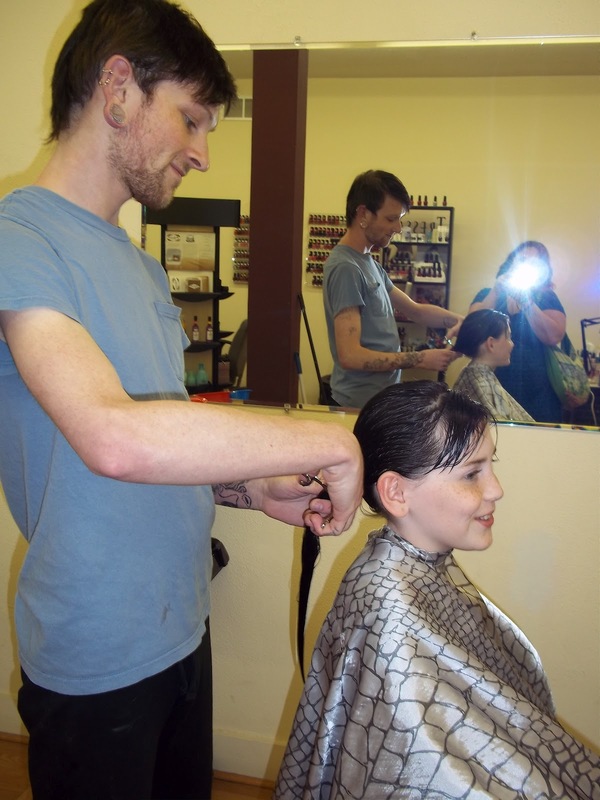 I called a hair salon and made an appointment with my cousin Dylan for Hannah and I to get our hair cut. 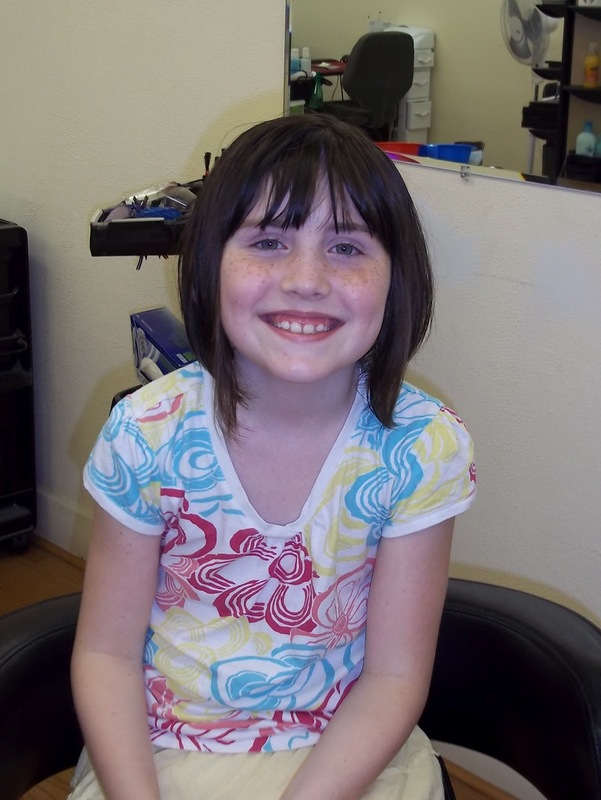 When we got there, they measured Hannah’s hair to give her an idea of how short it would be after they cut the 10 inches off. She was a little bit surprised at how short her hair would be if she went through with the donation. I could tell that she was anxious, so I volunteered to go first to give her a little bit more time to think about it. As Dylan was finishing up my hair, Hannah came over and said that she had given it some more thought and she was definitely going to donate her hair. 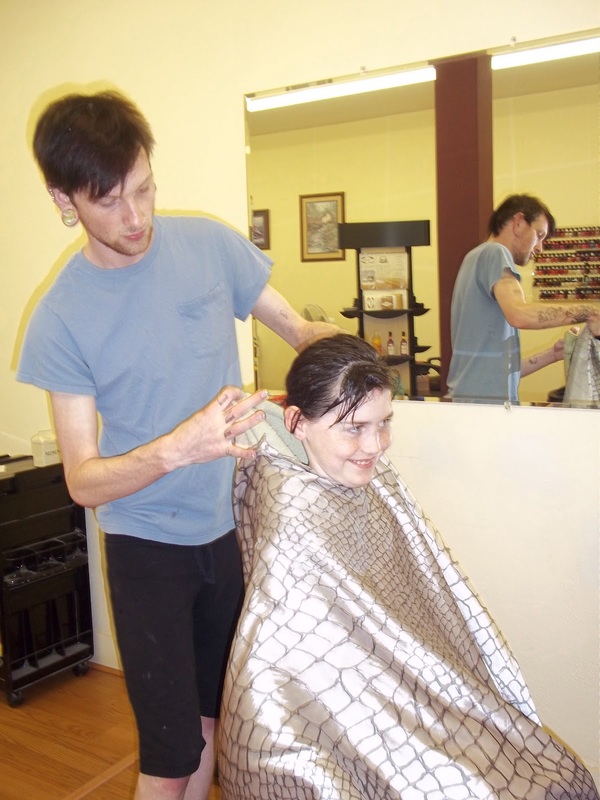 Dylan walked her to the back of the salon and washed her hair. She was grinning from ear to ear. 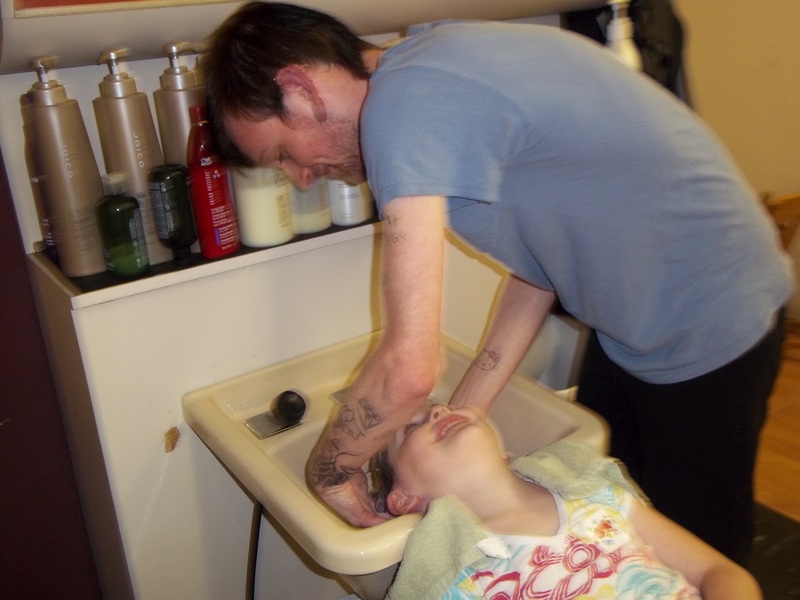 She loved getting her hair washed. Here she was getting ready for the big cut! Dylan kept telling her that it was the last chance to change her mind, but she stood firm. “I want to donate.” she kept saying. Here is one last look at her long hair. Ready, set, CUT! There goes her 10 inch long ponytail! 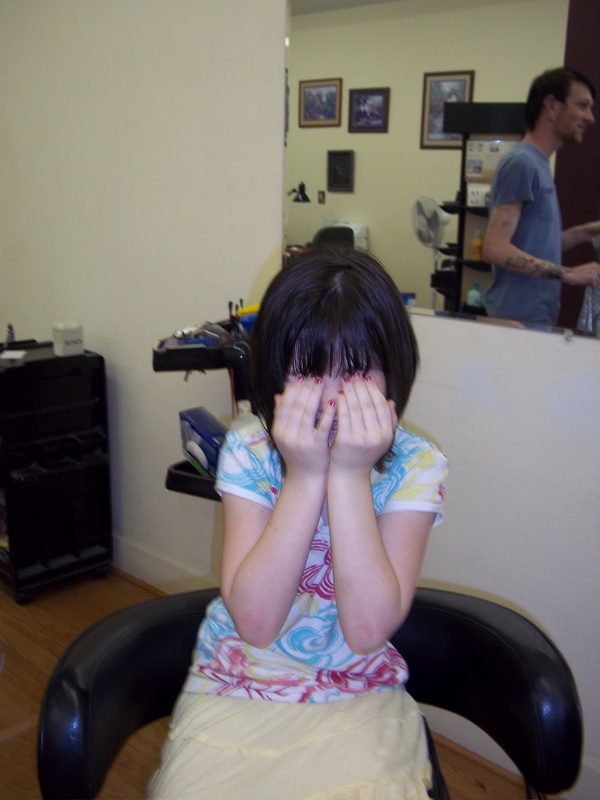 The first thing that she said was, “Wow…that is a lot of hair gone…” She looked a little bit nervous, so Dylan turned her around and told her not to peek until he was all done. Good move Dylan! Ta Da!!! The finished product! She looked adorable! Dylan did a great job on her hair and she loves it! We left the salon and went to the store and bought some cute headbands and clips for her to use. She looked at me and said, “Mom! I just realized something! I will be able to do my own hair for school and church!” That is an added bonus that both of us like! She has been trying out her new hair accessories and loving it. But the best part of all of this for me was that evening when we sat down to do our family prayers. When it was Hannah’s turn to say an intention that she would like to pray for, without missing a beat, she said, “I would like to pray for whatever sick little boy or girl gets my hair. I pray that God will heal them and make them better and that my hair will make them feel a little bit better and happier.” She is such a sweet kid. Hannah’s hair was beautiful but her true crowning glory is her heart of gold. She really is a princess! My dad…what can I say about my dad? Well for one thing, I have known him my entire life! Ha! But seriously, in today’s world with so many dad’s who aren’t in the picture, for whatever reason, I was blessed to have my dad with me every step of the way. He was there from day one. He is still there! Our relationship has changed and grown as I have changed and grown. He has been there to tell me, not necessarily what I wanted to hear, but what I needed to hear. 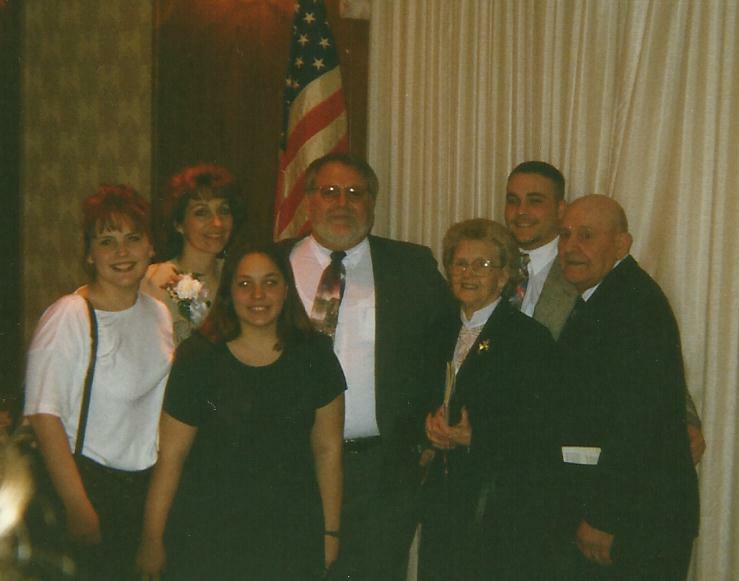 Speaking of throwing up, I am reminded of another funny family story. 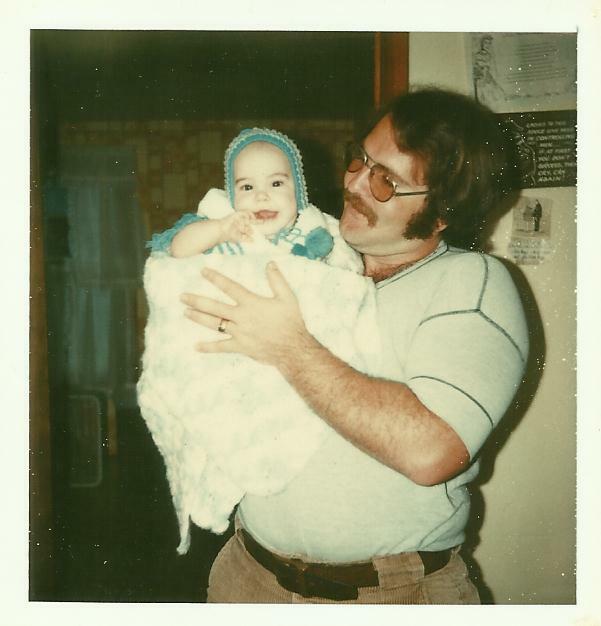 For as long as I can remember, my dad has always had a beard and/or a moustache. That is just a fact. The sky is blue, you have pay taxes and my dad has facial hair, period. Well, that is except for one fateful night… I was probably about 4 or 5 and for some reason I woke up and walked out into the kitchen where my mom and dad were. My dad had shaved his face. Beard and moustache were gone. I took one look at him started crying and threw up right there on the floor. 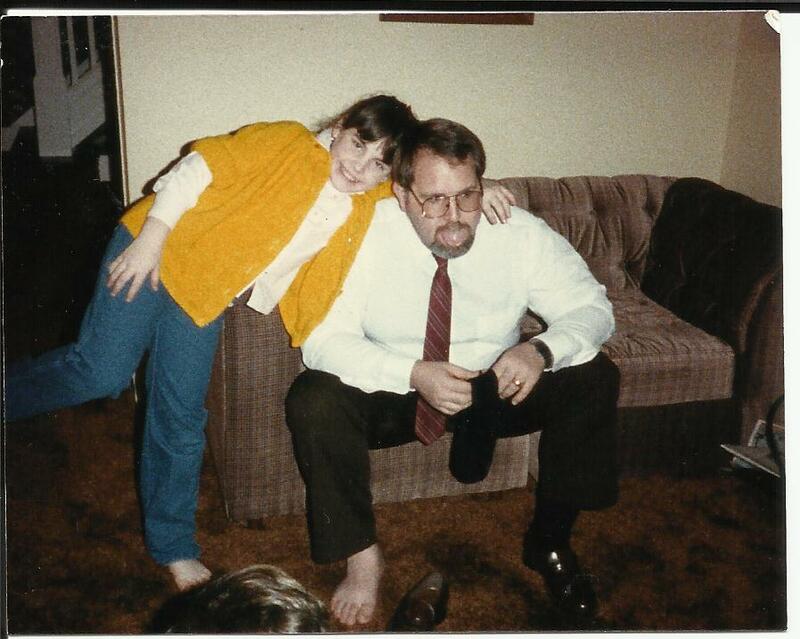 That was about 31 or 32 years ago, and Dad has had a beard ever since. Here we are when I was about 8 or 9. Dad was getting ready to go to work. When I was in elementary school and high school, I was always a good student. Mom and Dad made it known that we were expected to do our best. Dad was a great example of this. In fact I was done with school before he was. He always pushed himself to learn more and to better himself. ( He eventually became a doctor.) And I wanted him to be proud of me. I still have a note that he gave me telling me that he was proud of what a good kid I was. I keep it in my wallet to this day. I learned many things from my dad. For example a broom or a weed eater or a toilet brush are NOT, in fact magic wands. You actually have to put a little effort into using them. You don’t quit something while you are in the middle of it, regardless of what it is. And NEVER drive with your foot hanging out the window. ( I know, I was an idiot!) And one of the most important things…John Denver was and still is amazing. Anyone that knew me as I was growing up, knew that I was grounded for the majority of my high school life. I would get so mad at him. He was so mean and strict. I never got away with anything, ever! I would try to go to a party ( the kind of party that I had no business going to) and he would know. He ALWAYS knew! Probably because he was the principal at my high school. I would get so upset, but he would stay firm. (Thanks Dad! I know that I would have probably gotten myself into a lot of trouble if you hadn’t been so aware of what was going on. ) Boys were pretty much terrified of him, so that probably kept me out of trouble too. lol I thought that he was so dumb and so unfair! He didn’t know anything! And then I left for college. I was amazed at how much smarter Dad got as my college career went along. I stopped doing the opposite of what he told me to do out of spite and started to actually listen to him. He seemed to know what he was talking about. He was understanding when I didn’t do very well my freshman year. I was finally at a place where I couldn’t do well without studying. Instead of getting angry with me, he listened and helped me to take some extra classes during the summer to bring my GPA up. He was also supportive when I wanted to change my major from Biology to business. I started to realize that I could actually talk to him. I also started to realize that he would be honest with me, telling me what I needed to hear, rather than what I wanted to hear. Others realized that my dad knew what he was talking about too. 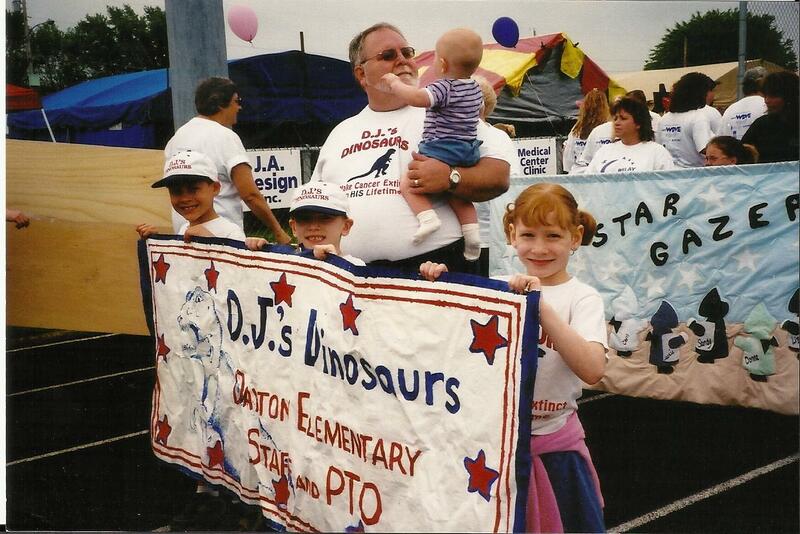 He did so much as an educator and a principal and eventually an administrator. Many people know and respect him for these accomplishments. This picture is of a time when we were all very proud of him. he had been nominated as Man of the Year! That is something to talk about! 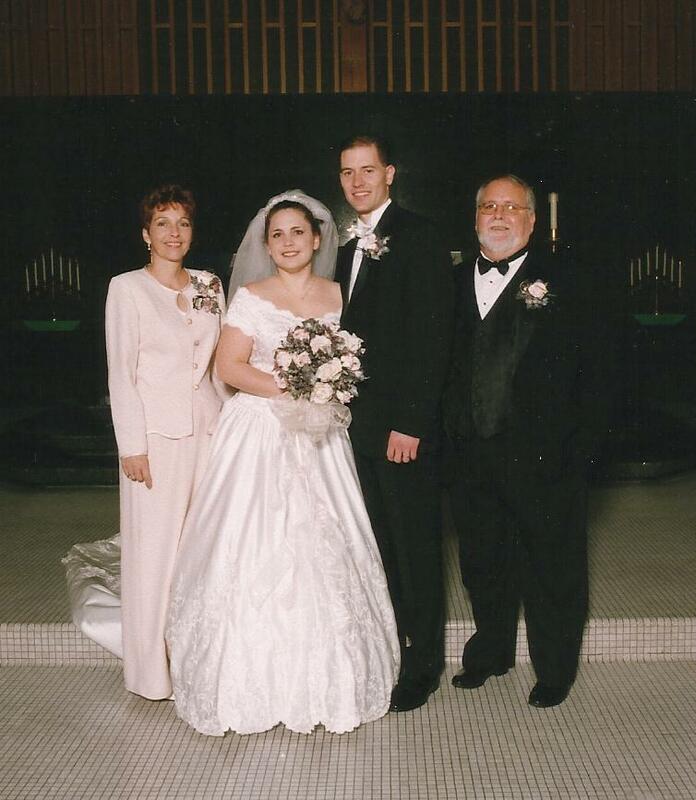 When I met Brian and we decided to get married after only 77 days, some fathers would be upset and try to stop it. Instead, he welcomed not only Brian but his three children into the family with open arms. 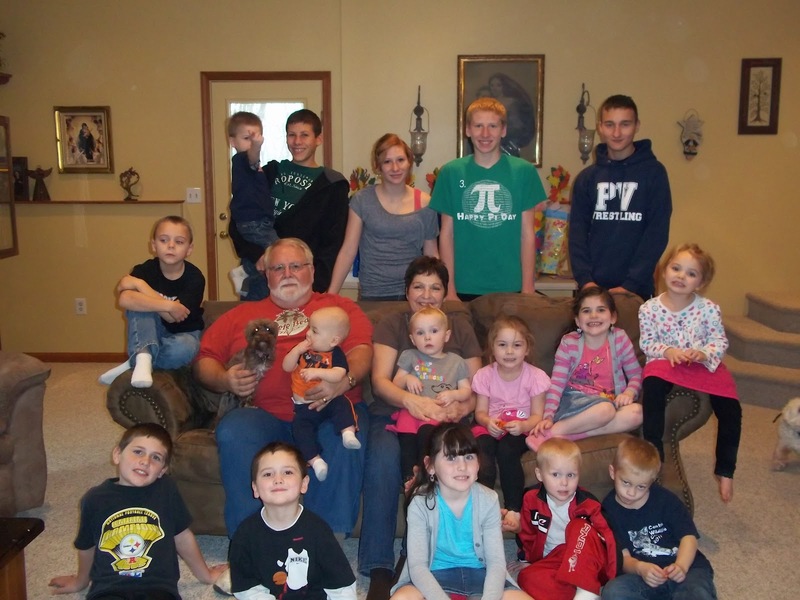 He was thrilled to have grandchildren. He went from being Dad to being Pap-pap. And he did happily. He was there when DJ was diagnosed with Leukemia. He drove us to his appointments in Pittsburgh until I was finally comfortable driving there by myself. He helped in any way that he could. It was such a scary time for all of us, but knowing that I had the support of my parents helped to make it a little bit easier to deal with. This picture was from the first Relay for Life that we participated in. At the time, Mom and Dad had four grandchildren with number 5 (Hannah) on the way. He is also a pretty great dad. Now that I am a parent, I have come to appreciate what a good dad he really is. As a mom, I have been charged with these 9 little human beings. Each one unique and different. Each one comes with their own gifts and blessings and trials. Some of these trials have been terrifying things that no parent should have to face. I have learned through these things that I can turn to my dad and share my struggles. He doesn’t always have the answers for me, just as I don’t have the answers for my own kids, but it is great to have a sounding board. He continues to get smarter and I hope that I do too. I love you Dad! Happy Father’s day! There are those days when, in my heart, I know that I love being a stay at home mom, but my head is not sure why. Thursday was one such day. It was the day before payday and we were basically out of everything, including cereal, except for the lone box of kix. That box of kix is the last resort cereal. It has been in the pantry forever. It was half empty and probably stale, but I couldn’t just throw it away. Somebody could get really desperate and actually eat it. ( Probably one of the teen boys that have stomachs of steel that are never full!) Besides, it was a really big box and it made it look like there was actually food in the pantry. Anyway, I woke up early that day in the hopes of getting a lot of things done around the house so that I would have time to do a few things that B had asked me to do on the computer. Yeah right. My kids know when I get up. It is like they have some kind of built in “Mom is awake” alarm that goes off the second my feet hit the carpet. I did manage to get a few things done and the house was basically tidied up. I fed the bottomless pits, also know as the lower third, their breakfasts and got everyone bathed and dressed. They were occupied with some toys and books and were actually playing together somewhat civilly. The baby was toddling around after them trying to keep up. Things were actually going pretty well. I was lulled into a false sense of security.You would think that I would know better… I sat down with my laptop to get some things done. Big mistake. All of the sudden I hear this sound, kind of a whoosh sound, the sound of half of a box of kix being dumped on the floor. Sigh. I get up and run over to assess the damage. The culprit, the 1 year old, is standing there grinning. He is holding the now empty box saying, “Uh-Oh!” Yeah, uh-oh is right. Kix are small and round and roll. They were everywhere. I immediately secured the baby in his highchair, so that I could run downstairs to get the sweeper. This mess required immediate action to prevent it from becoming even more out of control. Apparently immediate isn’t soon enough in this house. I walk up the steps to hear a new sound, kind of crunching sound. It was the sound of 9 million kix being ground into the carpet. The three year old was joyfully running up and down the hall way simultaneously kicking and crunching the cereal. Ugh. I picked him up and secured him in his time out spot. I started to sweep up the mess that, by this time, had now spread from the hallway into the living room, dining room, kitchen and even started to infiltrate the bathroom. I finally managed to get the chaos that had become my house under control (sort of) and fed the little monsters lunch. I breathed a sigh of relief when every mother’s favorite time of the day started…NAP TIME! I resumed my earlier attempts of doing the things for B on the computer and actually finished that up right as the baby woke up from his nap. I got him up and he happily toddled around following me as I took care of some housework (again). At this point mom called and I was telling her about my kix incident. Again, I allowed myself to get distracted. I hear the baby giggle. I look down and see my sugar baby, literally! He was carrying half a bag of granulated sugar around licking his hands and dipping them back into the bag. His face, hands, arms, belly and hair were covered in sugar. He looked like had had been dipped in a vat of sugar. He was crystallized! Yet another totally unnecessary mess to clean up. As I picked him up to give him his second bath of the day, he smiled and said “Mom, mom, mom!” as he patted my face with his sugar coated hand. (I try to get that little bugger to say “mom” all of the time. Usually, he just grins and says “Dad!”) That is when it struck me. I was reminded of why I am a stay at home mom. Because it is messy and sweet all at the same time! Just like my kids.